Artistic, technical drawings, is something that has been lost in a small part with the advent of CAD (Computer Aided Design). The beauty is in, as much as the finish image, as the lines, points and curves that are required to calculate the positions of these drawings in motion. 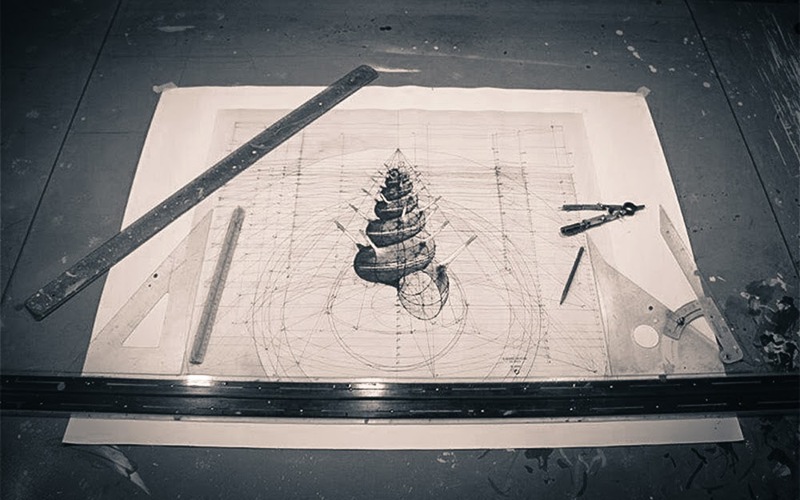 Venezuelan Artist Rafael Araujo creates a perfect blend between Mathematics and Art. Araujo starts off with a pencil, compass and ruler, then he moves to ink and paint. He has now switched paper for a canvas, and says that a coloured drawing can take 2 to 300 hours to complete. Unlike a computer programs, if you make a mistake with ink, it is very difficult to correct. Because of the precise nature of such a complex geometric drawing (He calls Calculation) any mistake would be glaring obvious. All the points above make these drawings a pleasure to watch. This one is not an Animated Gif. Have a look, he has also calculated and drawn the shadows for the butterflies.